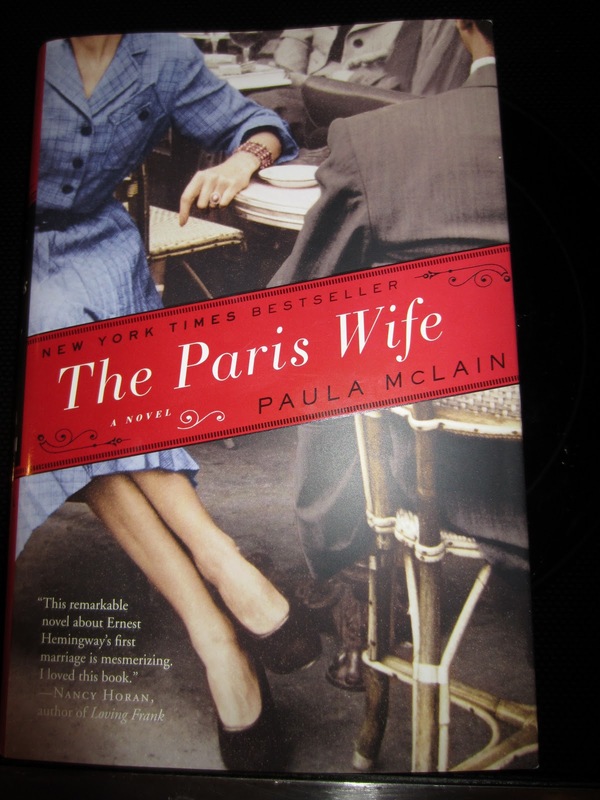 One good book leads to another – if you have read Hemingway’s memoir, A Moveable Feast, you have your next book: The Paris Wife. I liked that he finally recognised what he had lost with his divorce, from this comment: “I wish I had died before I loved anyone but her (his first wife, Hadley).” Paula McLain writes primarily in Hadley’s voice providing her version of events. A previous biography (Sokoloff, 1973) is quite good, but this novel portrays the woman who loved him, for himself, and is fascinating! 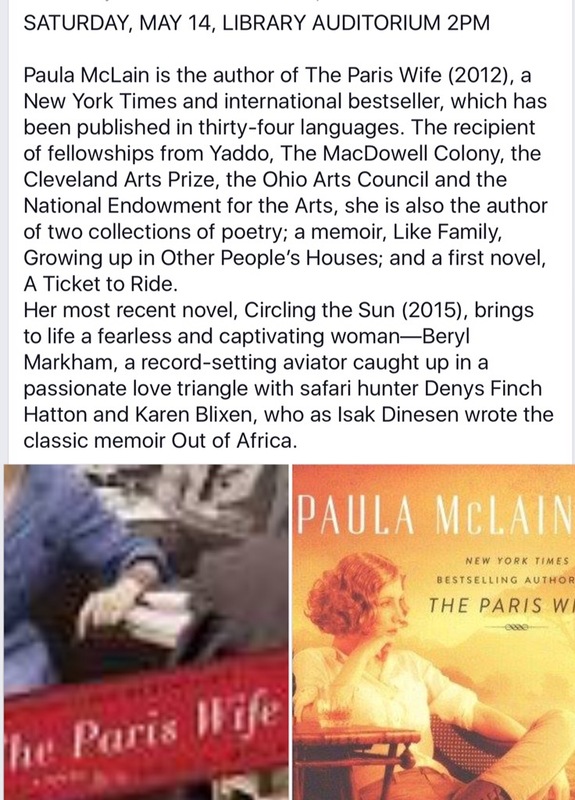 McLain painstakingly researched the biographies, letters, and Hemingway’s novels, to accurately detail their lives, including their marriage (1921-1926). She is also a poet, which is evident in her language craft and evocative prose which captures the glamour, emotions and trials of the 1920s, Europe and especially Paris. Hadley (Elizabeth Hadley Richardson 1893-1979) was a 28 year old midwestern girl when she met the 21 year old Hemingway who was already brash and ambitious. You are caught up in their whirlwind courtship and the infinite possibilities that await them in life (even knowing the baggage that came later, you love the current story). Her inheritance enabled them to move to Paris and initially provided Hemingway with the stable environment which promoted his writing and provided him with material/ experiences. The reader is charmed by the warm generosity, beliefs and support of Hadley, delighted by the glittering expatriate world which is littered with well know literary and artistic figures as Gertrude Stein, Zelda and F. Scott Fitzgerald, Ezra Pound, James Joyce, Ford Maddox Ford, Jean Rhys, and many others, and heartbroken when their marriage dissolves, unable to survive the fame, the drinking and womanizing, especially in wake of the birth of their child (John Hadley Nicanor Hemingway “Bumby”) and her family values. Hemingway wrote The Sun Also Rises during this time frame, dedicating it to her (and their son) partly in recognition of her sacrifice to his art. The royalties were hers as well. I will always wonder if she had stood up to him more, what greatness they could have achieved together. He desired her because she was not the independent, modern woman, but forgot she was her own person. She struggled to find her place in his ever changing world. While she embraced his adventures, the outdoors, the bullfights, etc their romance withered with jealousy, celebrity, ambition, and depression. McLain is also sympathetic to Hemingway, recognising his early troubles, from his controling mother, the trauma of the great war and his depression. We know the man he became. Hadley married journalist and political writer Paul Mowrer in 1933 (Pulitzer 1929), eventually moving back to Chicago. He was also the Poet Laureate of New Hampshire (1968). Bumby (1923-2000) went on to become an American writer and conservationist (he finished the memoir, A Moveable Feast). 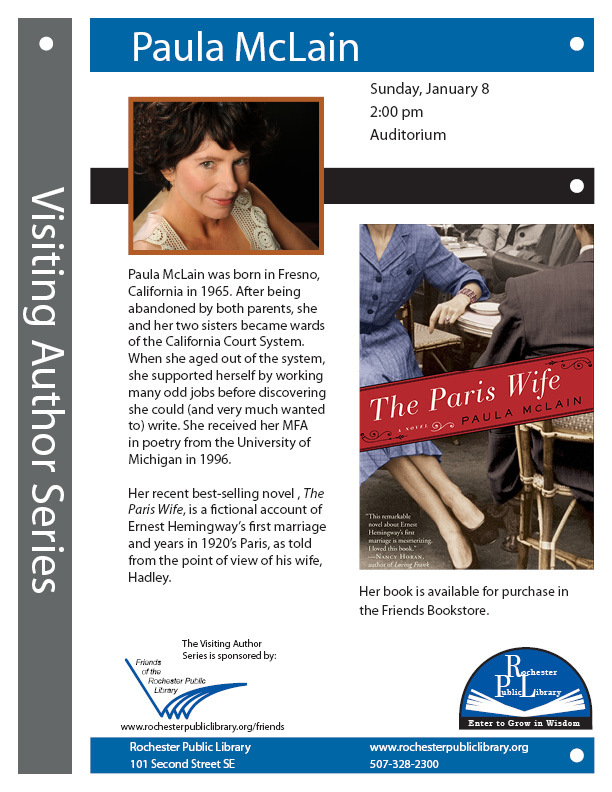 Paula McLain will be here in the Library this weekend! Sunday 8th January – DON’T MISS IT! This is a beautifully written and captivating story and promises to be a fascinating discussion.The book is also for sale in our Friends Bookstore! I am so glad she is a friend of one of our Librarians,- what an opportunity to have her visit Rochester! This was my first exposure to her work. I would have been hugely disappointed if I had missed this book!